Description: Tenochtitlan, Entrance of Hernan Cortes. 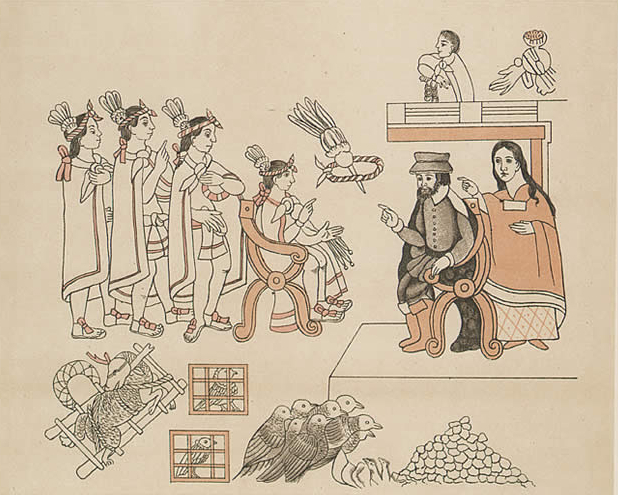 Cortez and La Malinche meet Moctezuma II. , November 8, 1519 The imasge is from the "Lienzo de Tlaxcala", created by the Tlaxcalans to remind the Spanish of their loyalty to Castile and the importance of Tlaxcala during the Conquest. The text mixes European and native styles and includes anachronisms, such as the European-style chairs included in this image.